Meet Magento Poland will be hosting four Inchooers. Some of them, as Inchooers can be, are keen to share their knowledge and insights regarding various Magento topics. 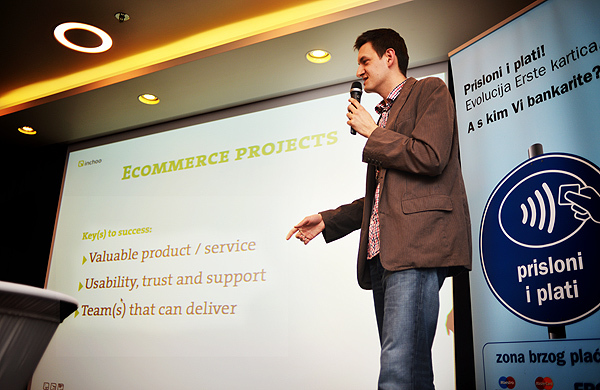 This time around, event will host Aron Stanić talking about Magento Solution Partner Program and everything that comes with it. Aron, tell us something about yourself. What do you do at Inchoo, and what do you do outside of work? How did you end up applying for Poland? Aron: Hi there 🙂 At Inchoo I’m leading our sales team, trying to ensure our consultants, designers and developers are not getting bored but have some interesting projects to work on. You can also see me write an occasional blog post here and there. I decided to apply for MMPL because I had an interesting topic to share and, since I was already a speaker at last year’s Meet Magento Netherlands and attended a couple of Imagine conferences, I got to experience the real vibe around Magento community – so, you can say I kind of got hooked. Aron: My topic will revolve around Magento’s Solution Partner program and our experiences from being a part of it for 5 years now. There are some really good things about it, but there is also a great deal of improvement possibilities, especially with the rollout of Magento 2. So, I will share my thoughts on things that are currently working well and some of those that we’d like to see changed, for the benefit of everyone involved (Magento, partners and merchants alike). How much time you have to present it and what would be the ideal person listening to you talk? What kind of knowledge is necessary to have for starters? Aron: I have a 30 minutes slot in the agenda – I see it’s just after lunch break, so I believe the people will be refreshed and ready to participate. The ideal persons would be fellow Magento partner companies and those who are looking to become one, and any merchants attending will also find some really useful insights into how Magento and its partner companies work together and what kind of value they can get from working with an official partner. What will they need before the presentation? Open minds and clear hearts. 🙂 The topic will be easy to digest. If somebody wants to know more about the topic before the presentation itself, where can they learn more? How should they prepare? Since you are an experienced lecturer, how do you feel preparing for Poland? Are you still excited and or nervous the same? How much do you teach and much do you learn as a lecturer? Aron: Excited – of course. Nervous – it depends on how much time I have to prepare well for any presentation. This time I’m also looking to get some help from our fellow Solution Partners in the preparation so it will be a good way to strengthen some ties even before the event. What would be your main message for everyone coming to Poland for MM? Aron: Enjoy the ride! This event, from what I was able to see so far, will be filled with interesting content – you’ll have a standard set of presentations, a number of workshops (which is a new thing, and workshops are a great way to start a conversation on any topic), there’s even a competition in place for the best and brightest of Magento in Poland (sites, modules etc.) – and of course, a Hackathon as well. But, I would like to also bring attention to store owners who are attending that we have prepared something special for them – free eCommerce SEO consultations by our consulting team. You can learn more about it at the link above and sign up directly here to be one of the companies we will provide with useful insights and recommendations to improve their business. See you in the front row of Arons talk or on free eCommerce SEO consultations we’ll be hosting!